It’s the first Friday of February, and that means a new First Friday Food post! My mom and grandma have a Toddy, which is a cold-brewing system for coffee. They swear by this thing, and it intrigued me. Basically you make a concentrated coffee syrup, which you can reconstitute with water at a later date to make coffee. Upon investigation, cold brewing coffee is a pretty popuplar thing. According to what I saw on the Internet, there are two main advantages of doing this: you can use just as much as you need, instead of making a pot and throwing away the leftovers, and it actually has different properties than regular coffee, specifically, it tastes smoother, and less acidic. I also discovered online that you can make this pretty easily without buying any sort of equipment. So we decided to give it a go. Step 1 was to buy the coffee. To make this work, you need coarse grounds. This meant buying beans and using the coffee grinder at the store, which kind of terrified me. However, I managed to not make too much of a fool of myself. We went with the rich and bold dark roast from Trader Joe’s. The way this works is that you soak the grounds in cold water for about 12 hours. This is what makes the concentrated syrup, and also why it tastes different than traditional, hot-brewed coffee. After the coffee has been sitting, you need to strain out the grounds. A commercial system like the Toddy comes with filters, but we had to invent our own setup. 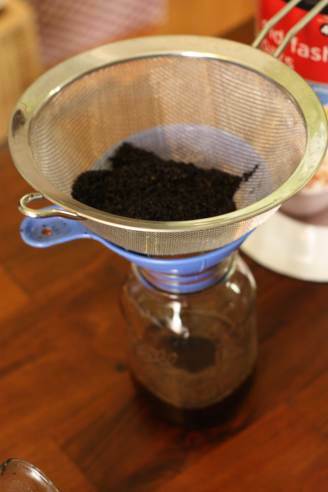 Next up is to filter the concentrated coffee through a regular coffee filter. Having something to hold up the filter is key, because this is a long slow process, and you are NOT going to be able to hold it the entire time. One tip we learned after making this once was to do a first pass on the grounds with just a close-knit, mesh strainer. This gets 99% of the grounds out, so the rest will go through the coffee filter faster. The next part is to just put it through the filter. This will take a LONG time (we’re talking hours), so you just pour some in and then go away for a while. At first it will go through the filter faster, but as you go along, the filter gets a build-up on it, which makes it go slower. EDIT: Using cheese cloth instead of paper filters improves this time from around 2 hours, to around 1 minute! It certainly does taste different than regular, hot-brewed coffee. If you were comparing cold-brewed to hot-brewed straight up, then it would just be a matter of personal preference. For me, the hot stuff tastes just as good, though different. However, the cold stuff has other advantages. By far the biggest advantage has to do with the options it provides you: the coffee concentrate is fantastic for coffee flavored drinks. After we figured this out, we never used it for regular coffee. At the very least, we made it with hot milk instead of water. This gives you a café au lait that is the equivalent of anything you’d get at a shop. You can make delicious iced coffee drinks. You also have the ability to control the amount of coffee flavoring you want, so it allows you to make really strong coffee too. In short, making regular old coffee with the concentrate is really only the beginning, and probably the least of what you’d want to do with it. Once Sara tasted cold-brewed coffee made with milk, she never wanted coffee any other way. There are also advantages for the casual coffee drinker, such as being able to make one cup here or there when you want it. It is certainly faster and cheaper than making an entire pot and then throwing away half of it. There’s not really a recipe per say. 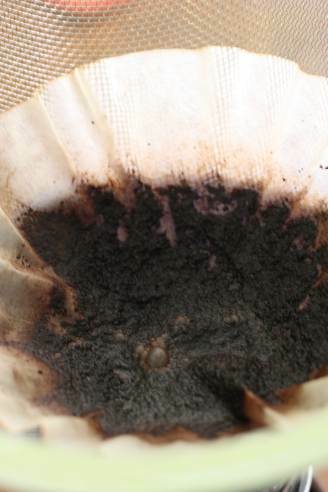 Put coarse ground coffee in a pot of cold water in the fridge overnight, and then filter it. The 1st time we did it, we used 5 cups of water to 1/2 lb coffee. The second time we used 10 cups water for the same amount of coffee. All that happened was that we had weaker concentrate, so we had to use twice as much to make a cup. In other words, stick to the 5 cups of water. This is especially true since the hard part is putting it through the filter. With the 10 cups of water, it took ~2 hours to go through coffee filter. So don’t waste the time with all the extra filtering, stick to the 5 cups of water. I don’t have a precise measurement on how much of the concentrate to use with a cup. It depends on the type of coffee, the concentration of water, etc. I would say, in general, you need about a double finger’s width of coffee in a large coffee mug. More or less to taste. This is really interesting! I’m always trying to figure out how to better replicate expensive coffee drinks at home. This might be a good option! Do you have a milk steamer like they use in coffee shops or do you just heat it on the stove? No, we don’t have any fancy equipment. We usually just heat the milk up in the microwave actually, except recently when our microwave was fried. Of course, if you have ice coffee, you don’t need to heat anything! We took a coffee class last summer at one of our local shops. It was fascinating. We got to taste how brewing the same beans in different ways tastes totally different. We tried cold, brew, as well, straight up, like a shot. It was a bit intense for me, but I haven’t tried cutting it with hot milk, or using it in iced coffee good to note! Pingback: Cold Brewed Coffee: Update « Is this thing on? Pingback: Confessions of a newly minted coffee addict « Is this thing on?